Network industry experts believe it is not a good idea to forgo and reduce structured cabling and invest in a network switch. Copper structured cabling has life span of 4 to 6 years. This is not due copper itself but due to faster and less expensive and a faster bandwidth offered and Internet bandwidth trend . Faster bandwidth ~ Higher quality cable and connectors ~ faster switch and router . Network infrastructure cabling has been evolving almost every 3 years now, From IBM type I, II to Cat3, Cat5 , Cat5 e, Cat5 E, Cat 6 , Cat 7 and Cat 7a to future Cat 8 cables. Structured cabling investments have a life span of at least 3 or 4 times the life of network hardware, therefore it is crucial to build a structured cabling system that supports any and all existing technologies and hopefully build in growth. Our study and years of experience installing infrastructure cabling through the world has given us the knowledge to make the following best recommendations. Based on the number of the drops and how many years corporate is planning to occupy the building , we make the following recommendations. Regarding number of cables per drop, you need to examine your voice ( VOIP ) , data ( in house Server or Cloud) deployment strategy , then you be able to decide to have or two cables per drop in case you wan to install copper technology . Your decision and planning is much simpler with "Single mode fiber with Passive optical lan " since this technology deliver up to 1Gig to the desktop , plus analog video and you have choice of POI or none POI work group terminals. Following is information that covers the three network infrastructure technologies and topology . You can contact us in case you have question regarding deployment of any of them. The system should have option for different topologies and tier structures. It is recommended to have a combination of copper and fiber to maximize flexibility and minimize cost. In addition to investment protection, structured cabling also provides administrative and management. Copper cabling may never take a back seat because setting up network wholly on fiber used to be expensive and still a good option if you have less than 250 single drop project . ( 250 + use Passive optical lan solution ) . Copper cabling standards are designated as Category 3 ( voice ), Category 5, Category 5e, Category 6, Augmented Category 6 (Cat 6A), Category 7, Category 7A (augmented). Electronic Industry Association/Telecommunication Industry Association (EIA/TIA) 568A standard defines multiple categories or upgrading of structure cabling system performance while the category 6, 6A, and 7 are the highest currently standardized at present. Category 5 is having a natural death. It is a very old standard. Most of the cabling vendors have quit cat 5 manufacturing. Category 5e was ratified in 1999 which has superceded cat 5. The frequency range of 5e is at 100 MHz frequency. It has improved durability and signal capabilities. It has less electronic interference over Cat 5. This copper cabling is widely installed across India currently than any other cabling infrastructure. It is well suitable for horizontal cabling requirements. It is also an affordable technology. Cat 5e has been adopted more for large horizontal cabling requirements for higher bandwidth in commercial networks, software firms, educational institutions, and high rises. Category 6 cabling operates at 250 MHz frequency. It is the best performance specification for UTP and shielded category twisted pair (ScTP). Cat 6 demands more stringent requirements than Cat 5 and 5e for instance installers ought to maintain half an inch or less of untwist at the termination, proper bend radius and avoid short links less than 15 meters. It utilizes RJ-45 connectors and they are backward compatible to Cat 5e. The prominent USP of Cat 6 is that it is an interoperable standard. Category 6a operates at a frequency of 550 MHz. It is backward compatible with the existing standards, this technology is suitable for industry sectors utilizing high-performance computing platforms to support very high bandwidth-intensive applications. 10G/Cat 6a applications would initially be deployed in server farms, storage area networks, data centers, and riser backbones. It supports 10G. Category 7a is known to operate at 1,000 MHz but it is yet to be ratified. It is at a very eraly stage. Cat-7A is catching up well across the verticals. While commenting on the advantages of cat 6 and 7.There is not much difference between cat 6a and 7 in terms of performance but there is difference in pricing. Investment while upgrading from Cat 6 to Cat 6a installations would increase by 25% and from cat 6a to 7 would rise to 40%. The rapid growth of bandwidth requirements and the changing role of enterprise networking are causing disruptive change in the enterprise Local Area Network (LAN). Incumbent vendors are recommending upgrading Ethernet switches to 10 Giga-bit Ethernet (GbE) uplinks which typically require single-mode rather than multimode fiber optic cable and replacement of lateral CAT 5 cable with CAT 6 cable. 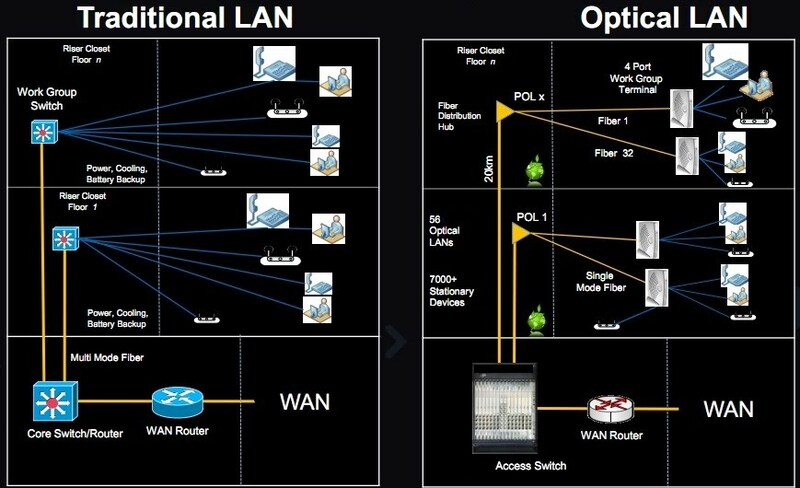 Enterprises facing such disruptive change to either an existing enterprise site or a new enterprise site have the opportunity to dramatically reduce Total Cost of Ownership (TCO) by moving to a Passive Optical LAN (POL) solution, rather than continuing with the Present Mode of Operations (PMO) which uses a two- or three-tier switched Ethernet solution. We know low cost bandwidth would fundamentally change everything. Information technology will be more about video than text or pictures . consider if television in the 1950′s evolved the same way that the internet has. TV in its infancy was little more than radio with text – much like the early stages of the web. What if television started with many, many channels but they all offered slow text, perhaps a few graphics. Video will have major impact in corporate ( i.e HR videos, Training Videos, internal and external video conferencing and web advertising ....etc. ) . corporations know, they need to be a media company broadcasting their values, products and services in order to offer their forte. Over time, maybe ten years or more the television broadcast networks evolved to allow some blinking graphics, then motion graphics via flash files that allowed you to see moving images accompanied with text. How powerful a medium would TV have been up to that point. Would it have consumed our lives the way it has? Would it become the focal point of our entertainment, our advertising, our news consumption? With the Internet today we are close to where television started over fifty years ago. Video is widely viewable today online around the world ( I.e YouTube ) but the experience varies considerably. That will change over the next few years as good or great quality video will be delivered to any screen you want it on (tv, computer, mobile devise). When that happens this will have a profound effect on how business communicate and evolve. All above is translated to use a infrastructure technology that can last above 25 years and also deliver the fastest , low cost bandwidth to the desktop . This technology exist and presently deployed in more than 12 million residential and small businesses ( Verizon FiOS ) through united states . Therefore there is no question on its maturity and reliability. Passive optical LAN ( POL ) or Passive optical network ( PON ) also can easily deployed within corporate , school , university , city and municipality buildings . Looking at the following two pictures , it is very easy to see the CapEx and OpEx saving and cost reduction . 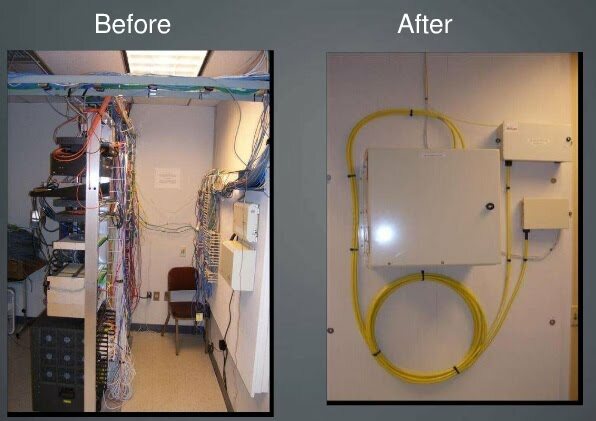 "Until recently, wireless did not provide the performance capability of structured cabling systems (SCS) using copper and fiber cabling," said Frank Murawski, President of FTM Consulting. "(But) newer technologies, such as 802.11n have now placed wireless on a par with structured cabling systems' performance. He added that future technologies including 802.11ac and 802.11ad will provide further performance improvements. In addition, the proliferation of newer mobile devices, such as newer smartphones and tablets, especially the Apple iPad, has placed increasing pressures on enterprises to allow for these devices to be connected to the enterprises' network. "We view the Apple iPad as a game changer, being universally accepted, in conjunction with enterprises' apps being developed for use within enterprises,"
Moderate impact on the SCS market over the short term with SCS market growth declining from 22.9% in 2011 to a 14.7% growth by 2016. Severe impact in the far term, starting in the 2016 to 2017 time period. family consists of a series of over-the-air modulation techniques that use the same basic protocol. The most popular are those defined by the 802.11b and 802.11g protocols, which are amendments to the original standard. 802.11-1997 was the first wireless networking standard, but 802.11b was the first widely accepted one, followed by 802.11g and 802.11n. 802.11n is a new multi-streaming modulation technique. Other standards in the family (c–f, h, j) are service amendments and extensions or corrections to the previous specifications. 802.11b and 802.11g use the 2.4 GHz ISM band, operating in the United States under Part 15 of the US Federal Communications Commission Rules and Regulations. Because of this choice of frequency band, 802.11b and g equipment may occasionally suffer interference from microwave ovens, cordless telephones and Bluetooth devices. 802.11b and 802.11g control their interference and susceptibility to interference by using direct-sequence spread spectrum (DSSS) andorthogonal frequency-division multiplexing (OFDM) signaling methods, respectively. 802.11a uses the 5 GHz U-NII band, which, for much of the world, offers at least 23 non-overlapping channels rather than the 2.4 GHz ISM frequency band, where all channels overlap. Better or worse performance with higher or lower frequencies (channels) may be realized, depending on the environment. is a wireless computer networking standard of 802.11 currently under development which will provide high throughput Wireless Local Area Networks (WLAN) below 6 GHz (what is commonly known as the 5 GHz band). Theoretically, this specification will enable multi-station WLAN throughput of at least 1 Gigabit per second and a maximum single link throughput of at least 500 megabit per second (500 Mbit/s). This is accomplished by extending the air interface concepts embraced by 802.11n: wider RF bandwidth (up to 160 MHz), more MIMO spatial streams (up to 8), multi-user MIMO, and high-density modulation (up to 256 QAM). On January 20, 2011, the Initial Technical Specification Draft 0.1 was confirmed by IEEE 802.11 TGac. 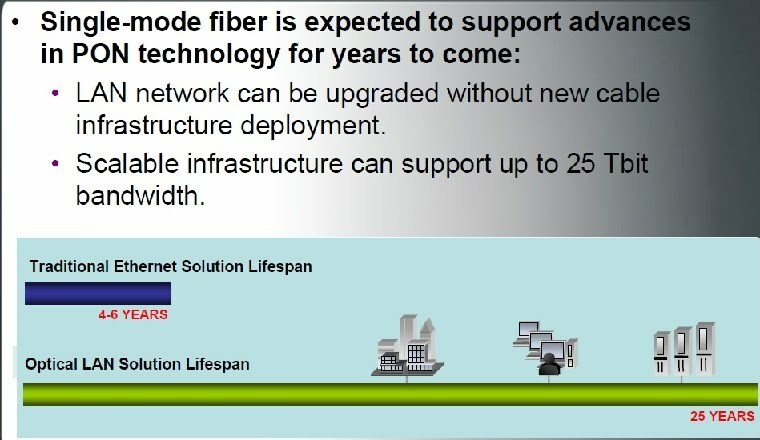 Standard finalization is anticipated in late 2012, with final 802.11 Working Group approval in late 2013. According to a study, devices with the 802.11ac specification are expected to become common by 2015 with an estimated 1 billion spread around the world. As of September 2011, there are no consumer devices implementing the draft specification. B1 B2 Assumes short guard interval (SGI) enabled, otherwise reduce each data rate by 10%.